Dom Genovese has quit as joint-manager and director of football at Peterborough Northern Star. Dom Genovese has resigned as joint manager and director of football at Peterborough Northern Star. Genovese notified chairman Tony Zirpolo of his departure yesterday (September 20) after seven months in charge of the first team with Seb Hayes. 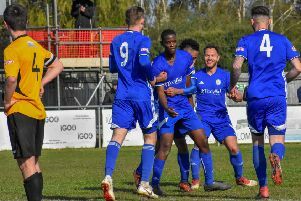 He blames his unexpected exit on differences of opinion with a new board of directors at the Chestnut Avenue club who are fifth-bottom in the United Counties League Premier Division. Genovese said: “Since the appointment of new directors in the summer I have found myself undermined and over-ruled on footballing matters. “That is not something I felt could continue therefore I made my decision to resign from both positions. I’m disappointed to have to do it, but feel it is the right decision. “I brought Seb into the club last season and it is a shame I am not to be able to work with him for longer. I hope he can be successful and I will help him out in any way I can. “The chairman wanted a local team on a reduced budget and we’ve given him that. Hayes will now take sole charge of Star who go to Rothwell Corinthians for a Northants Hillier Senior Cup tie tomorrow night (September 22). Hayes and Genovese guided Star to Hinchingbrooke Cup success at the end of last season. They stepped in after the sackings of Darren Jarvis and Michael Goode who are now enjoying success at Holbeach and Deeping respectively. Genovese becomes the second managerial departure in the local non-league game in the space of three days after Raff Mazzarella – a former Northern Star reserve chief – resigned as Bourne Town manager last Friday (September 18). Genovese will continue to run his Soccerstar FA academy from Star.